The Cosmos Club Restoration | John Canning & Co.
Where loss had occurred, traditional Dutchman were carved from matching wood species, glued, and scraped down to a flush surface. Doors to the exterior balcony were removed, squared and glued at joints, then reinstalled. The Cosmos Club is historically significant for a variety of reasons. Its importance is derived from a diverse past relating not only to the building it occupies, but also to the club itself. The private men’s social club was founded in 1878 by distinguished geologist John Wesley Powell, and housed in his home. Its members were notable men of science, literature, the arts, and public service. In 1988, 110 years later, the membership decided that there were women of similar distinction who would also be acceptable. With the admittance of poet Maya Angelou, the club managed to achieve two membership milestones in one. From 1886 to 1952 the Cosmos Club occupied several historic residences along the northeast corner of Lafayette square, including the Dolley Madison House. In 1952, the membership purchased the Townsend Mansion at 2121 Massachusetts Avenue, where it is currently located. The rise of the Cosmos Club mirrors the rise of Washington Society during the gilded age. An outlying area of Washington shanties and slaughterhouses, Dupont Circle in the 1870s became the city’s most fashionable address. The addition of paved streets, electricity, and sewers made it attractive to Curtis T. Hillyer, a California mine owner, one of its first investors. Hillier built a house on the site now occupied by the Townsend Mansion. 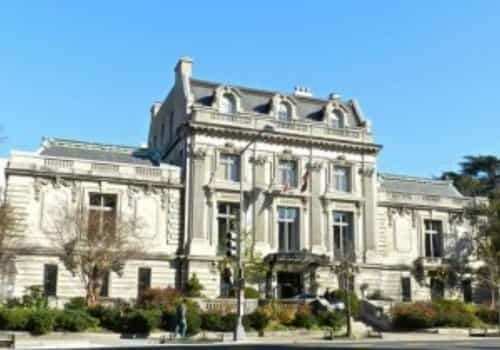 The British Embassy was built shortly thereafter, and by the turn of the century, Dupont Circle was ringed with mansions of families who had made their fortunes elsewhere but wished to establish a social presence in the nation’s capital. The Townsend Mansion replaced Hillyer’s House at the direction of new owner Mary Scott Townsend, heiress to her family’s railroad and coal fortunes. She commissioned fashionable Beaux Arts school architects John Mermen Carrère and Thomas Hastings. Their portfolio included hotels, churches, and estates along the east coast, and they had won the contest to design the New York Public Library. 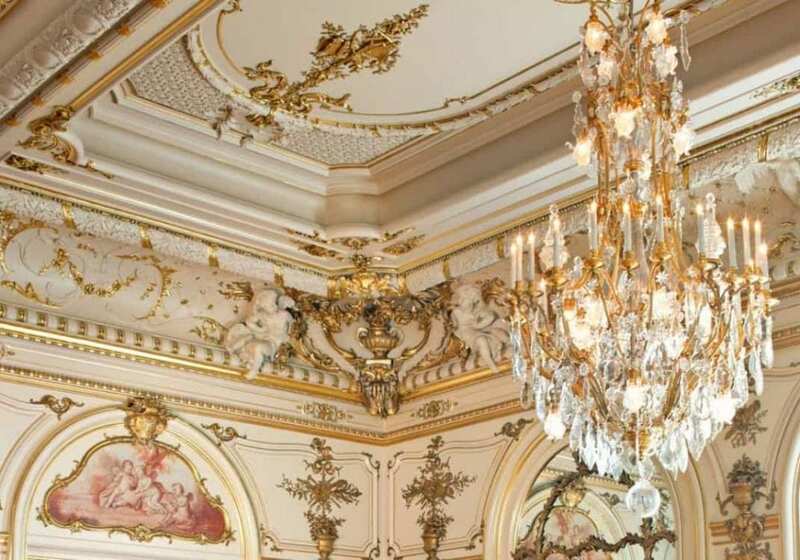 The exterior is inspired by Louis XVI, and the interior blends a variety of French historical decoration styles. The Townsend mansion is one of five surviving, grand residences built around 1900 designed for entertaining on a lavish scale, their hostesses making up Washington’s new social scene. In 2011, the John Canning Company was selected by the Cosmos Club ownership to restore the Warne Ballroom to its original style. 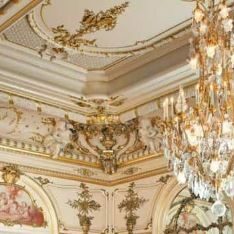 Over the years, the Louis XV rococo style interior had become drab and dingy with damage from water intrusion and neglect. 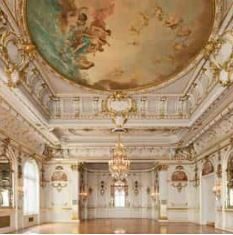 Our work in the ballroom encompassed the restoration of finishes, gilt conservation, artwork conservation, plaster repairs, and wood conservation and restoration of the walls, doors, windows, and parquet floor. 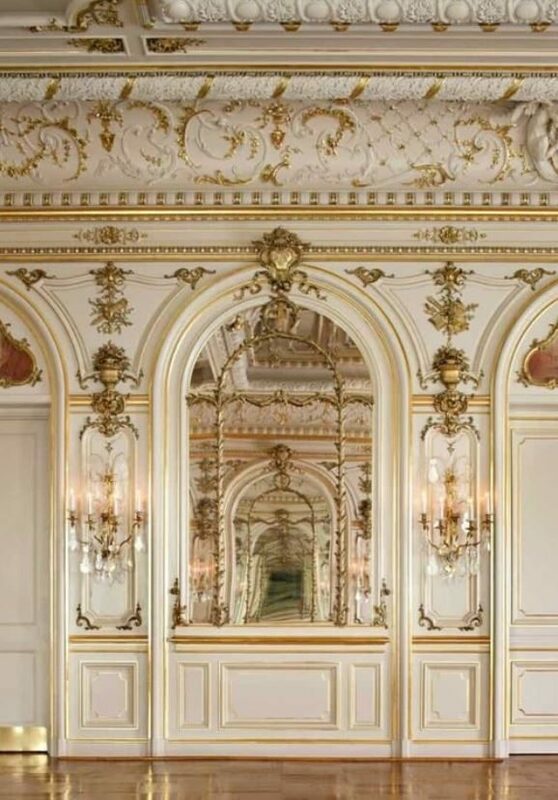 As stated in the Project Specification Manual, “The complex form of the boisserie (paneling) includes curved and shaped styles and rails with inset raised panels, embellished with ormolu ornament of gilded moldings, plaster cartouches, trophies, and acanthus scrollwork. While the design is derived from 18th-century prototypes, the panels are constructed from thin wood laminates, thus serving as examples of early architectural plywood. Intact ornamentation was carefully removed, cataloged and stored for later re-installation. Water intrusion over time had caused the veneer to split and delaminate. The panels were mechanically stripped of their paint, and delaminated veneers were glued and warmed with a flatiron to assure adhesion. 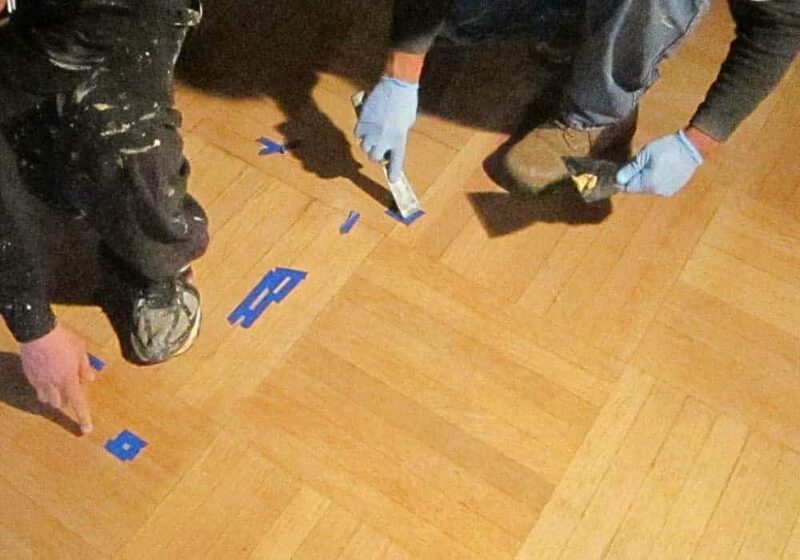 Our goals were to clean, conserve, repair, and re-coat the ballroom parquet floor. Areas of stain were cleaned or minimized using a solution of oxalic acid rinsed with ph neutral water. As with the wood paneling, areas of loss were repaired using oak Dutchmen tooled and fitted by hand then toned with stains to blend with the aged, adjacent wood. The floor had been refinished by sanding so many times in the past that in many areas the wood had thinned to expose the tongue and groove joints, weakening the structure. We decided that chemically stripping the floor would be the right way to achieve our goals. Once repairs were made, and stains attended to, we prepared satin and high-gloss finish coating samples for evaluation. The high-gloss finish was selected by the owner and their representatives. The finish was achieved using four coats of amber-tinted Tung oil that enhanced the red highlights of the oak. 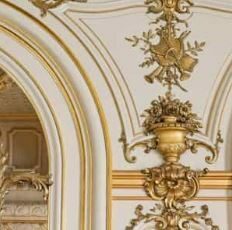 In keeping with the fanciful rococo period ornament it emulates, the ballroom interior is composed of plaster surface decoration on the ceiling and walls, with shallow relief and depressed or semi-circular arches. The decoration is asymmetrically styled, yet unified, with meandering and wistful s-scrolls and wave-like lines. The ceiling is composed of three coffers, ceiling coves, and the entablature at the top of the walls. The cove at the west elevation was more damaged than originally thought. The repair required a large section to be removed and, owing to the asymmetrical rococo style, replaced with a cast of ornament from the southeast corner - the only other area with identical design. Other areas with advanced water damage had to be stabilized and the ornament recast and replaced. Ironically, some of the most complex plaster work required remains unseen. 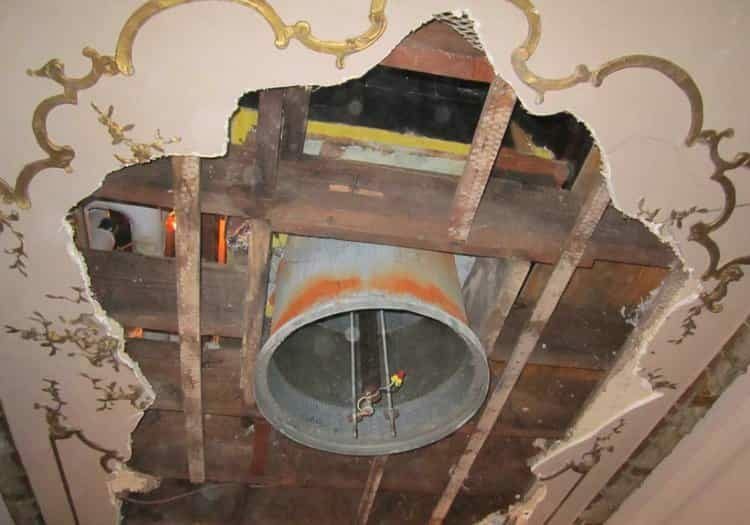 The wood substructure, the foundation to which all the plaster adheres, was in need of serious repair. The original construction for the north coffer was work furring nailed to the wood joists. Below the furring was wood lathe and traditional three-coat gypsum plaster, followed with applied plaster ornaments. We stabilized what we could, and rebuilt the center and east section of the coffer. We cleaned an vacuumed the backside of the retained plaster, consolidated it, secured furring back to joists followed with hemp-filled plaster wads holding the backside of plaster to the furring. 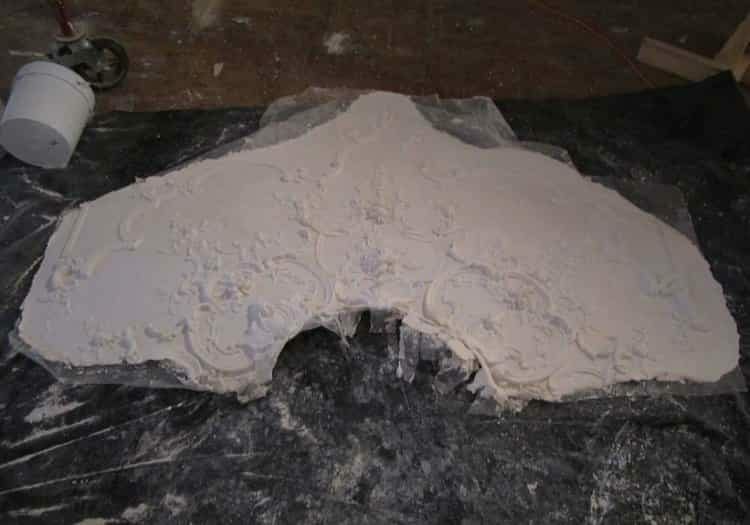 This was followed by three-coat plaster and the application cast ornaments. Delamination and splitting of the wood paneling also caused some losses of ormolu plaster ornament on the walls. Those were cast and replaced along with the conserved decoration that was removed before repairs to the walls were made. 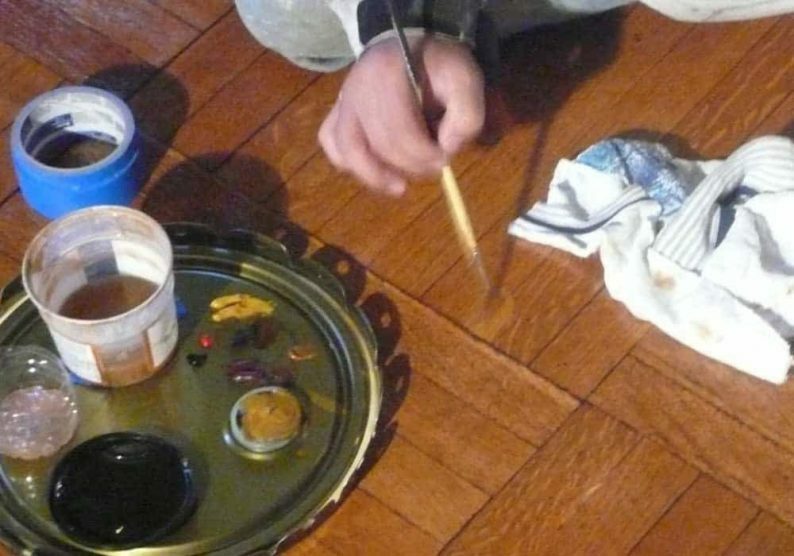 A paint analysis performed in 2008, and ours performed as part of this scope both documented major shifts in the colors of successive coats of paint in the room. In some locations, as many as 10 layers were identified with each layer successively darker that the one before. Over time the room had taken on a multi-tone gray scheme, with the ceiling painted much darker than the walls. We matched our findings to a pale gray for the walls and ceiling, with certain areas of the ceiling receiving a slightly darker shade to provide a slight contrast and deepen the dimensional definition of the ceiling details. The ormolu garlands of flowers, plants, and urns as well scrolls and lines and other molding shapes were primarily made of plaster, with the chair rail and other traditional moldings made of wood. All of this ornament received gilding of one or multiple varieties. In a preliminary study, it was discovered that much of the gilding was intact, but had been covered with bronze paint over time. We were able to remove the bronze powder paint from most areas and conserve the original gilding. We used a gel-based solvent to increase the dwell time and successfully remove the paint without harming the original gilding. 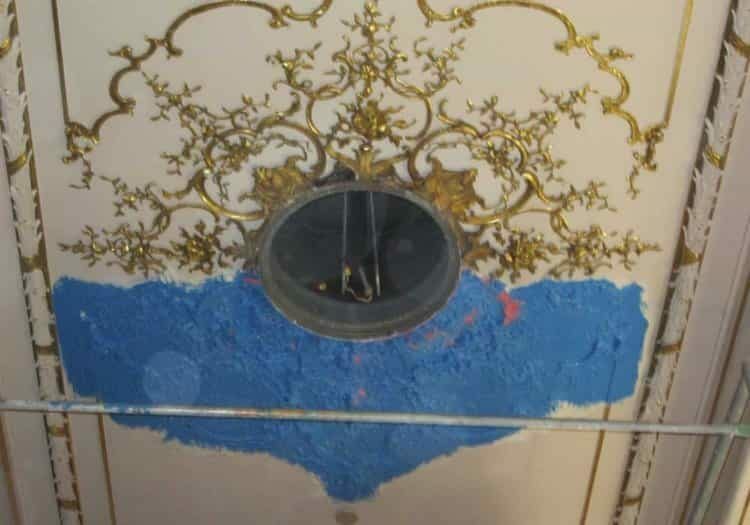 In other areas, where the original gilding layer would be damaged by paint removal, the decision was made with the owners to re-gild on top of the bronze powder paint. 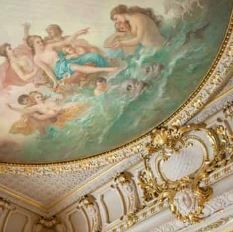 In all, 80% of the ceiling was re-gilded using traditional oil method. In all, four types of gilding techniques were used: oil gilding; matte water gilding, burnished water gilding; and matte and burnished gold powder in glue. The gilding varied according to type and location of the ornament, enhancing the dimensional perception and detail of the designs. The large central ceiling mural, or tondo, and paintings in the lunettes were conserved in place. 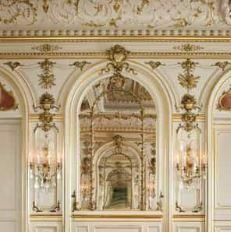 In addition, there were three, rose cameo style paintings mounted in the elongated and ornate curved areas over the interior doors. Their conservation was done off site. We carefully removed the decorative moulding surrounding the paintings and the door header on which the panels rested. We were then able to slide the canvas covered wood panels out of the door frame. We devised a system for reinstallation of the door header that would allow for easy removal of the paintings for future work if need be. The three paintings were not made specifically for this room or these spaces. They were pieced together from other works, combined with new canvas sewed to each side in order to fill the elongated curved spaces. The artist for the ballroom, likely not the original paintings’ artist, then extended the paintings, matching the techniques and forms, and softly blurring out to the edges to make these works conform to the spaces. The seamed canvas areas needed reattachment, and the work overall required cleaning and conservation to bring these darkly soiled paintings back to their original pinkness and light. In this process we could clearly see the additional figures and forms that had been added. Finally, we mounted the paintings to aluminum-faced panels and reinstalled them. The Cosmos Club allowed ten months for all of these areas to be addressed. Owing to our experience in project planning, we completed the room in seven months and under budget. 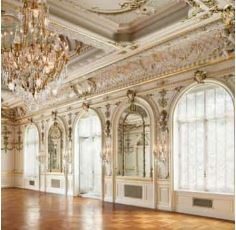 The completed ballroom is at once a study in subtlety and splendor, consistent with the rococo period design it emulates. The slight variation is shades of gray, the soft sheen of the finish combined with four types of gilding, combine to create a room with opulence, balance, and restraint. This project was recently awarded 2017 Preservation Award from the District of Columbia Awards for Excellence in Historic Preservation. To view the press release, click here.